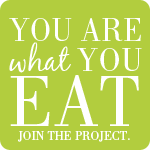 Check out this week's Food Matters Project recipe. I purchased wheat berries weeks ago, and decided to use them in place of the rigatoni. Since I'm not a big pasta fan, I turned this into a whole grain salad instead of a baked pasta dish. This was the first time I've made wheat berries and I think they work perfectly here. Wheat berries are a whole, unprocessed grain that contain all of the parts of the grain: germ, bran, and endosperm. They are rich in magnesium, potassium, and vitamins B and E. Some say you most soak the grains overnight before cooking and I agree. Not only does this cut down on cooking time, but it might make the grains easier to digest as well. This makes a hearty winter salad, and it's easy to pack for lunch. Substitute brown rice to make it gluten free, and omit the cheese to make it vegan. Put wheat berries in a bowl and cover with water. Soak overnight. Rinse wheat berries. Put in a soup pot, cover with water and bring to a boil. Reduce heat, and simmer for an hour. Heat olive oil and ghee in a sauté pan. Add the onion, cooking until translucent. Add a pinch of sea salt and the brussels sprouts. Cook, stirring, for about 5 minutes. Add the garlic and cook for another couple of minutes or until the brussels sprouts are wilted and slightly browned. Remove from heat. Add the balsamic vinegar, orange juice, and zest to a saute pan. Bring to a boil, reduce heat, and simmer until the sauce has thickened. Remove from heat, pour into a small dish, and add the figs. 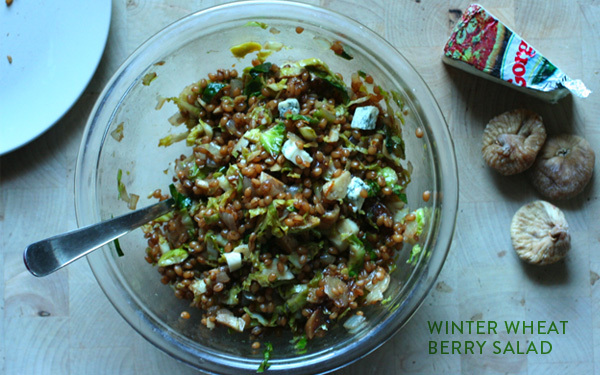 Mix the wheat berries, brussels sprouts, and fig mixture together. In a smaller dish, whisk together the walnut oil and white balsamic, if using. Pour over the salad along with a pinch of salt and pepper. Crumble gorgonzola over the salad and serve. Love the spin on not using pasta! love that you use ghee too! What a great idea to use the wheat berries. I did a salad similar to this last year. But I'll keep in mind about soaking the wheat berries ahead of time- I don't think I did that. Wow! 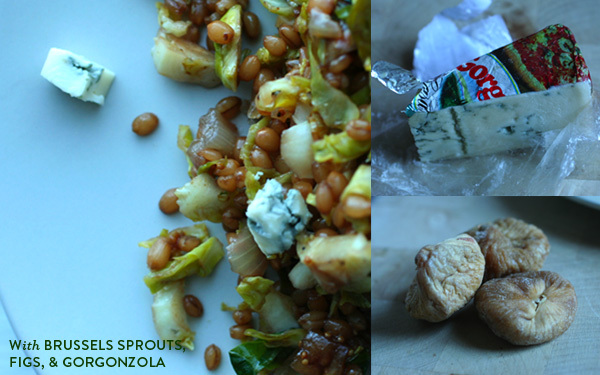 I can't wait to make this when winter rolls around in the southern hemisphere - brussel sprouts, blue cheese and dried figs sound great. I'm adding it to my to-do list right now. Love your interpretation of this week's recipe! The salad looks delicious. I have never had wheat berries... The pictures and the description convinced me that it is good. Love how you turned this into a salad! I'm such a fan of wheat berries, and totally agree they need to be soaked overnight. I love this grain with balsamic vinegar, and can't wait to give your recipe a try. I'm a not fan of pasta myself but my mom never made it growing up. I always thought I was missing out.